Team Landscape Wizards wishes all its visitors a very happy and a prosperous 2013. 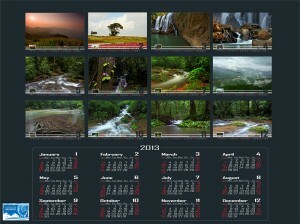 We are just clearing off all the year end corporate calendar and print orders. As mentioned on our FB page couple of weeks ago, we have a few handful of calendars with us which were created as a part of a bulk order. If you would like to lay your hands on one of these “Western Ghats” themed desktop calendar for yourself, feel free to get in touch with us at the earliest. For those who are yet to finalize on bulk corporate order, we have some really exciting offers still running through our inventory list based on the quantity that you would like to order. We do have more concepts other than the one which is ready for pickup for smaller quantity. Drop in a note with your contact details and we shall get back to you on the pricing and shipping details. Alternatively you can now order Calendars and Posters online via all new LW Store.